For learning Chinese there are both good and bad reasons to get started. Let’s hop in with the worst reasons to study Chinese. Why it’s a bad reason? Because it’s not motivating! And our lives are too short to feel guilty about things, let alone not learning Chinese. It’s hard to turn this negative feeling into successful learning. Again there is a lack of motivation and even there is a chance you end up liking Chinese, most likely you will just feel like you wasted money on learning something you didn’t want to learn. What are the good reasons to study Chinese then? Let’s turn this negativity train around! The motivation comes within! This kind of student is likely to continue learning at least as long that reside in China. This need is pushing you forward. It could be need to communicate daily matters, to get points for you visa application or to get that HSK level onto your CV. You have a genuine interest in the Chinese culture and want to immerse in the new country. Language is the way to the hearts of the Chinese people, and you don’t want to miss it. Whatever your reasons for learning Chinese are, make sure the want or needs comes from within! 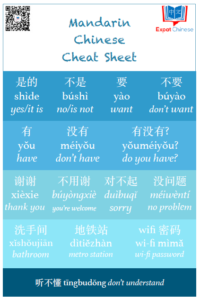 Check out our new Chinese language courses at Expat Chinese! A language center run by Sara Jaaksola, teaching Chinese the Western way.